The fiber optic industry saw a tremendous boom in the late 1990's. 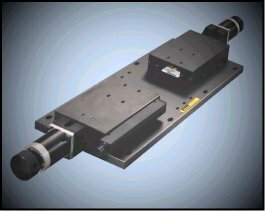 The resulting demand for optic fiber has caused high throughput production to be of utmost importance to high end manufacturer of fiber optics components. Along with high throughput are stringent quality standards where products are re-quired to pass demanding tests. Great investment is being made into capital equipment to auto-mate fiber production. Process equipment must meet extreme accuracy requirements to satisfy industry requirements. One such application is a special type of fiber optic coupling,.With this type of coupling two fiber optic strands are laid one on top of the other with the ends held in two chucks. The Chucks are mounted onto two high precision position table arranged as shown in the photo above. A light is passed through the fibers and feedback to a signal processing computer. The tables are commanded to move apart from each other at a very slow rate. At the same time the fiber optic strands are heated. The two strands merge into one and produce certain optical effects. The process is monitored by the signa l processing computer which controls the motion. These coupled fibers are than used as components to manufacture optical multiplexers, attenuators, and other devices . Many of these systems have been installed and used successfully in continuous production for over five years.